Big Papa Haydn’s keen understanding of the timbres and capabilities of the instruments allowed him to constantly play with the light textures of the combo while still packing the trios full of the kind of witty, elevated invention we have come to call Haydnesque. Schultz, Stewart and Ellis, playing Hadyn-period instruments in the historically informed style (this was a Bach Sinfonia concert, after all), gave a performance where the music sprang to life from the first notes with the kind of carefree joy that comes to audiences only from the previous hard work of performers. It was all the more surprising, then, that later in the program Stewart announced that Schultz would skip his scheduled performance of a solo flute fantasia by Georg Philip Telemann because he had a bad head cold. I am not a professional flutist, but it seems to me that breathing is an important part of playing the flute; it’s tough to imagine how good he must sound when his various respiration-related passages are not obstructed. Thankfully, he was able to play everything else as scheduled on Saturday, and I hope he recovers soon. Stewart covered for him by playing the first movement of a flute sonata by Carl Philipp Emanuel Bach. Like a lot of C.P.E.’s music, it can be heard as a young man’s rebellion against his famous papa, with phrases twisting up from their obvious conclusions into harmonically outré questions, moods changing seemingly bar-by-bar, and long pauses to make everyone think hard about the goings-on. Stewart committed fully to the ride, playing up the contrasts and wringing lots of drama out of her fermatas. Hearing the last two movements of the sonata after intermission allowed the first to hang in the air for a while like an unanswered question — an effect not inimical, I would guess, to C.P.E.’s intentions, and certainly a fun effect on Saturday. 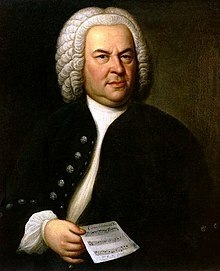 Those of you not steeped in 18th-century musical lore may be wondering how the Bach Project could gin up an entire program of music for flutes. If you guessed “Some guy with a lot of money and/or power played the flute,” you are of course right: That person was Frederick the Great, German potentate and skilled amateur tootler. Besides C.P.E.’s opus (his only work for solo flute), F.d.G. 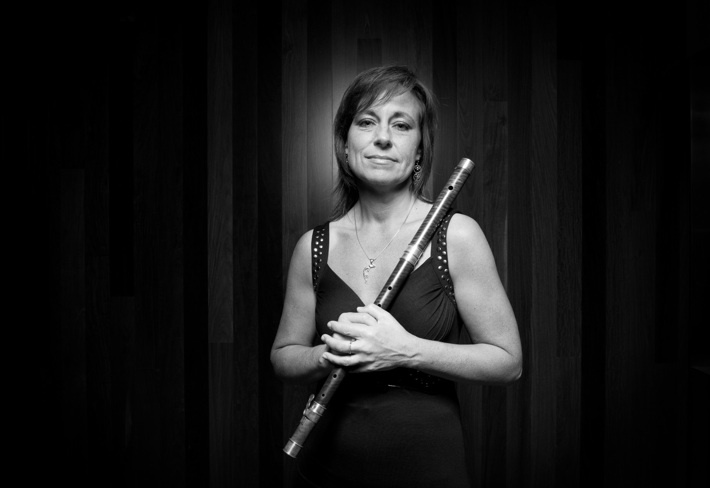 likely played two other works on Saturday’s program, duets by C.P.E.’s bro Wilhelm Friedemann and the king of the Baroque flute, Johann Joachim Quantz, who conveniently had the king who played the Baroque flute as his patron. This guy fathered 20 children with two wives. Ladies love cool Johann! On Saturday, W.F. Bach’s “Duetto” in E minor mostly sounded dour; Schultz and Stewart made fetching noises, but W.F. did not vary those noises enough to avoid monotony. Quantz came off much better in his D major Duetto, which showed a command of the various means of combining two flutes to imply harmonies that can only come from high-level familiarity. S&S made cool, poised work of the minor-key Mesto (“sadly”) slow movement, finding a kernel of real emotion, then swept all that away with a glittering fast finale. Jacques Hotteterre attained prominence as a flutist and composer similar to that of Quantz, and his suite for two flutes had similar fluency in the instruments and vivacity in the music. Like most people, I was not super-familiar with the literature for two or fewer flutes and no other instruments before this concert, so the only music on the program with which I was intimately familiar was the second suite for solo cello by the Bach from which the Sinfonia got its name. In his Haydn performances with Schultz and Stewart, Ellis provided a firm rhythmic underpinning, hitting his notes at just the right time to keep the melody aloft; playing by himself, he took a much more mercurial approach, sometimes burying the dance rhythms on which the suite draws in expressive gestures, sometimes accelerating or decelerating at unexpected times. The constant gear-shifting made the opening movements feel a bit aimless, but in the “Sarabande” Ellis shaped the phrases so they sounded organic, like breathing, a striking effect. He also dug into the rhythms a little more in the final two dances, which made their effect stronger (for me, anyway). And throughout, his cello sounded lovely, rich and warm but with the occasional rasp and whisper that make the period cello such a captivating instrument. It was good to have all three performers on stage for the Haydn that closed the concert: we got to hear Schultz and Stewart back on classical flutes, along with Ellis — hearing, one last time, these instruments so well-played and playing so well together was a final treat in a concert full of them. For this concert, Stewart not only wrote the program notes (which were engaging and lucid – professional program note writers should take heed) but also provided some intro remarks before most of the pieces (except Ellis’ solo). In one of these interludes, she mentioned that she is from Silver Spring (a graduate of Northwood HS) and that Schultz also has family in Silver Spring and in Rockville. It just goes to show – people from Silver Spring do great things. Or start blogs about other people who do great things. “You are either a really morbid crowd or very good supporters of friends and family,” Benjamin Olinsky told the audience assembled Friday night to hear the winter concert of the 18th Street Singers, for whom Olinsky serves as artistic director. Titled “In These, Our Darkest Hours,” the program embraced the bleakness of midwinter rather than ignoring it or trying to repel it with cuteness. But, of course, you only realize that any set of hours was the darkest after said darkness has lifted, and the collection of pieces presented Friday reflected that as well. Francis Poulenc’s “Quatre Motets pour le Temps de Noel” (“Four Motets for Christmastime”) and “Un Soir de Neige” (“A Night of Snow”) led off the first and second halves of the program and received some of the evening’s most satisfying performances. In the sacred work, the 18th Streeters crisply rendered the text — even though a few lines of Latin were missing from the program, I was able to keep up — while making a lovely sound that easily filled the warm acoustic of First Trinity Lutheran Church. The basses, in particular, sounded like a force of nature here and throughout the concert, a palpable presence deep in the harmonies yet capable of nimbly navigating melodies when called for. The Gregorian chant inspiration in the first of the four motets came across with appropriate gravity, and when the severity and wonder of the first three motets gave way to joy in the finale, “Hodie Christus natus est” (“Christ is born today”), the chorus’ sound lifted up too. “Un Soir de Neige,” conducted by assistant music director Nick Bath, also showed the singers at the top of their game, vividly limning complex harmonies and giving life to the wandering sufferer depicted in the texts and Poulenc’s settings thereof. This being an 18th Street Singers concert, classical mingled with other genres, but all the pieces were cannily chosen to reflect the theme of the evening, making for a tight, focused program. Felix Mendelssohn’s “Richte mich, Gott,” doesn’t ever seem fully committed to the laments with which it begins before finding light and hosannas, but the 18th Street Singers made the journey enjoyable all the same. Samuel Barber’s “Agnus Dei” sounded just distant enough from its source, his Adagio for Strings, to transcend the cliche the latter has become and accumulate great power from its implacable buildup, well-managed by Olinsky. These pieces bracketed warm performances of two traditional hymns, “Hark, I Hear the Harps Eternal” and “We Gather Together,” and the juxtaposition flattered all of the music. Some flubs made this concert a little less satisfying than last year’s winter edition. The soloist in “We Gather Together” could not be heard; a few entrances came in staggered fashion rather than in unison; and, most significantly, one or two of the sopranos could not comfortably hit the very highest notes they were called upon to sing, resulting in some unfelicitous screeching during the “Agnus Dei” and in a couple other pieces. In addition, the transition to the skein of nonclassical pieces that ended the program felt awkward, with the finely grained nervousness and exhaustion of “Un Soir de Neige” followed by a labored “Sometimes I Feel Like a Motherless Child.” “Deep River,” though, leaned on those wonderful basses to make a strong impact, and while at the time I was not wholly convinced by the arrangement of U2’s “MLK,” it’s grown more compelling in my memory. The concert closed with “Didn’t My Lord Deliver Daniel,” which was as vigorous as you could want and also provided the perfect closer for the program. Though this concert had the benefit of texts and translations in the program, Olinsky, assistant directors Bath and Sarah Redmond, and other chorus members took turns talking about the pieces before singing. Even though some of these remarks could have been pared by a sentence or two, they went a long way toward making the concert feel warm and personal, which (along with good singing) is what you want when you duck out of the bitter cold January wind to hear a chorus. The concert repeats tonight; tickets are $10, so if you like the idea of wallowing in darkness for a while before emerging into musical light, it’s worth stopping by. Updated to add Other People’s Perspectives: Michael Lodico. This year, Armonia Nova brought their Twelfth Night concert to St. Mark’s on Capitol Hill on the actual twelfth night of Christmas, Epiphany, celebrating the manifestation of God as man in the recently born Christ. 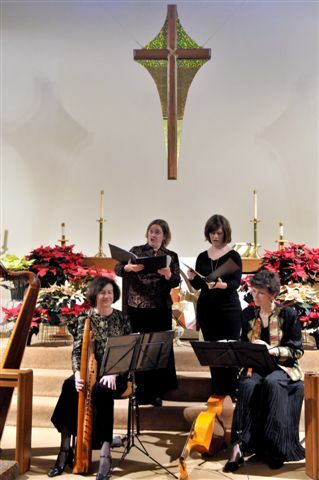 But the concert also celebrated the tenth anniversary of Armonia Nova’s cheering holiday tradition: a relaxed, intimate post-December 25 concert presenting lesser-known treasures of the medieval and Renaissance repertoire, and doing it with style. Artistic director and historical harpist Constance Whiteside told the audience that Friday’s concert featured some of the best of the previous nine years of Twelfth Nighting. There was accordingly a higher proportion of Xmas Classix than at last year’s edition of this concert, which was the first I had attended. Armonia Nova performing last year's Twelfth Night concert. Photo by Louise Krafft. Yet part of the fun of these concerts is discovering new songs of the season, and thanks to my nonattendance in prior years I was introduced to some beauties. Bunday sang “A solis ortus cardine,” a chant melody for an English Christmas Eve ceremony, with quiet, aching intensity. McKnight gave a similarly affecting reading of Jacques de Cambrai’s thirteenth-century “Chanson pieuse,” well-shaped and in luminous voice. In the canon “Nowel: owt of your slepe aryse,” the three singers came together without instruments, their voices close and shining in the small space. (Among its other pleasures, this concert reminds us that it’s really amazing to hear a lovely voice used well from 20 feet away, not to mention three such voices.) All the players joined for more overtly joyous celebrations in “Verbun Patris unmanatur,” a medieval English song, Guillaume Dufay’s jumpily rhythmic celebration “Vergene bella,” and the Provencal song “Guillo, pran ton tamborini,” the last featuring Whiteside on tambourine to goose the dance rhythms. Besides Barrack’s pinched tone and intonation problems on the gamba, the only clunker in this performance was its opener, “Ding! Dong! Merrily on high,” in which it proved impossible for the normally rock-solid ensemble of Bunday, Mondel, and McKnight to adopt the exact same tempo when melisma-ing the word “Gloria.” The group’s rousing performance of the closing “Veinticinco de diciembre” (with its delightful “Fum, fum, fum!” interjections) naturally led to an encore, which was a repeat of “Ding! Dong!” in which the audience was invited to sing along. If the professionals couldn’t stay in sync, we surely couldn’t, and pretty much every possible tempo was represented in the subsequent multi-car pileup of a group rendition. However, the group had one more trick up its sleeve: the presence of post-concert cake, a large sheet inscribed with frosting wishing Armonia Nova congratulations on ten years of Twelfth Night. A sweet ending for a treat of a concert. 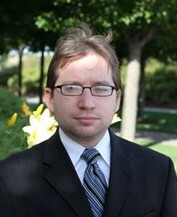 You are currently browsing the DMV Classical weblog archives for January 2012.